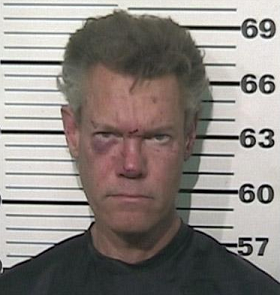 Who Knew Randy Travis Was This Cool? I love old outlaw country, but I can’t say I’m a fan of many country artists who have come out since. The over-the-top patriotic anthems and twangy ballads all sound the same, and if you’ve heard one, you’ve heard ‘em all. Before this week I lumped Randy Travis in with every other boring country crooner, but he may have missed his calling. He’s starting to build some nice outlaw country cred. Earlier in the year he was busted for public intoxication while sitting drunk in his car in the parking lot of a church. His 19-year marriage had recently ended, he was involved in a bitter court case with his ex-wife, and he was reportedly drinking heavily to cope. I know from hard-won experience there aren’t many answers at the bottom of a bottle, but that hasn’t stopped Randy from continuing the search. Late Tuesday night he was arrested when cops found him naked and drunk in the middle of a North Texas road. He had apparently crashed his 1998 Pontiac Trans Am into some construction barricades and then staggered into the highway for a well-deserved nap. As a final bonus, after he was put in the squad car, he threatened to shoot the cops who arrested him. This sounds like a perfect country song, and I know some people are disappointed Randy wasn’t driving a pick-up truck when he crashed, but I think the Trans Am is even more appropriate. From the four pop-up headlights to the small-block Chevy V-8, it’s the perfect embodiment of redneck chic. The only real drawback is that even though the car has a 325-horsepower engine, the brakes are absolutely terrible, and without after-market replacements, it’s an accident waiting to happen. Moral of the story, if you’re a somewhat affluent redneck who is drunk, naked and speeding through a construction zone at night in your 1998 Trans Am, splurge for the upgraded brake package. You’ll be glad you did.